The city is filled with an invisible landscape of networks that is becoming an interwoven part of daily life. WiFi networks and increasingly sophisticated mobile phones are starting to influence how urban environments are experienced and understood. We want to explore and reveal what the immaterial terrain of WiFi looks like and how it relates to the city. 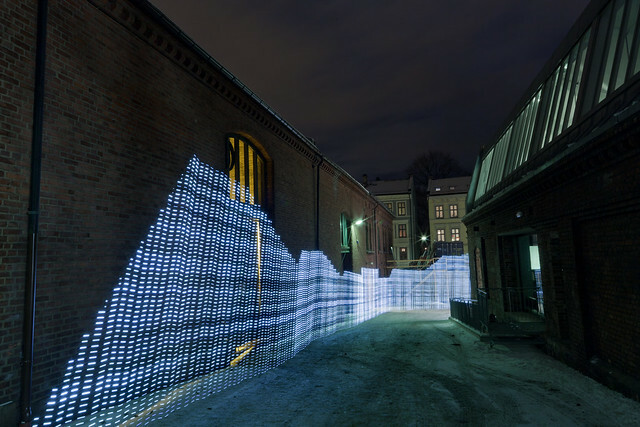 Immaterials: light painting WiFi film by Timo Arnall, Jørn Knutsen and Einar Sneve Martinussen. The measuring rod is inspired by the poles land surveyors use to map and describe the physical landscape. Similarly, our equipment allows us to reveal and represent topographies of wireless networks. The measuring rod uses a typical mobile WiFi antenna to measure reception, and draw out 4 metre tall graphs of light. Walking with the WiFi measuring rod. 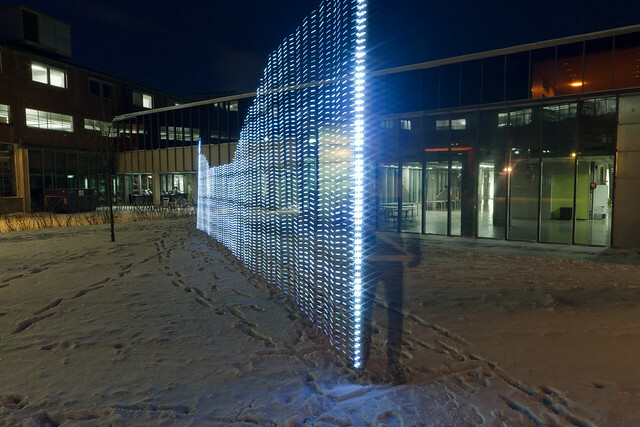 The size of the measuring rod and the light paintings it creates emphasises the architectural scale at which WiFi operates, and situates the networks in the physical environments that they are a part of. The light of the measuring rod pulses as it is being moved, which creates dashed lines rather than solid ones. This creates a semi-transparent texture that allows the visualisation to appear within the physical setting without covering it. 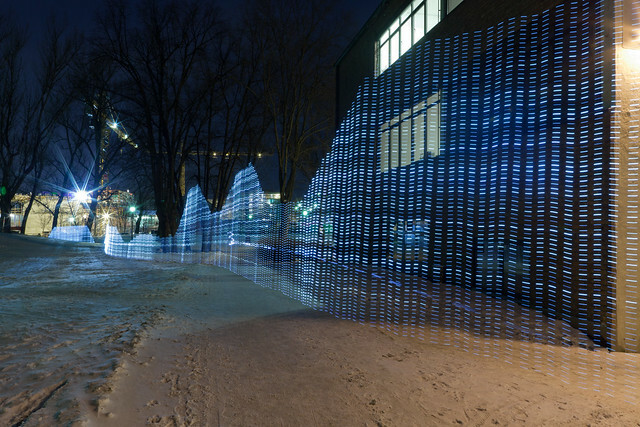 The dashed lines makes it possible to see through the graphs..
December in Oslo is dark, making it an ideal month for light painting. During a few weeks of walking, measuring and photographing we visualised a number of networks in the Grünerløkka area in Oslo. The visualisations illustrate how WiFi networks in this neighbourhood are ubiquitous, but also fragmented and qualitatively different. The strength, consistency and reach of the network says something about the built environment where it is set up, as well as reflecting the size and status of the host. Small, domestic networks in old apartment buildings flow into the streets in different ways than the networks of large institutions. Dense residential areas have more, but shorter range networks than parks and campuses. A WiFi network from an 1890s apartment building spilling into the street. 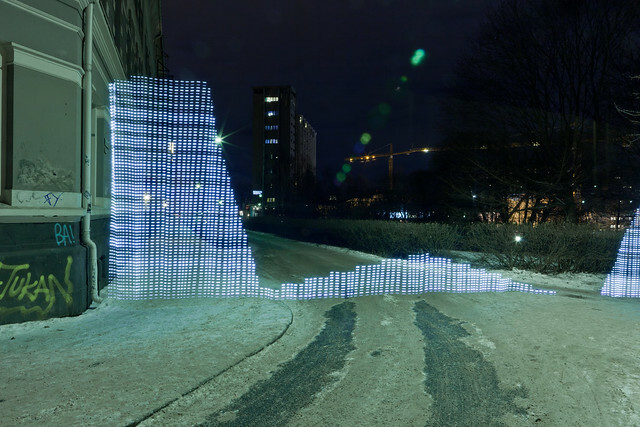 A dense network in the forecourt of the Oslo School of Architecture and Design (AHO). Our expeditions around Grünerløkka, and the time-consuming work of measuring networks by walking with a 4 metre tall instrument gave us a sense of the relationships between WiFi networks and the physical environment. Architectural forms, building materials and the urban landscape shape how networks spread into the city, and can make WiFi seem spatially unpredictable. 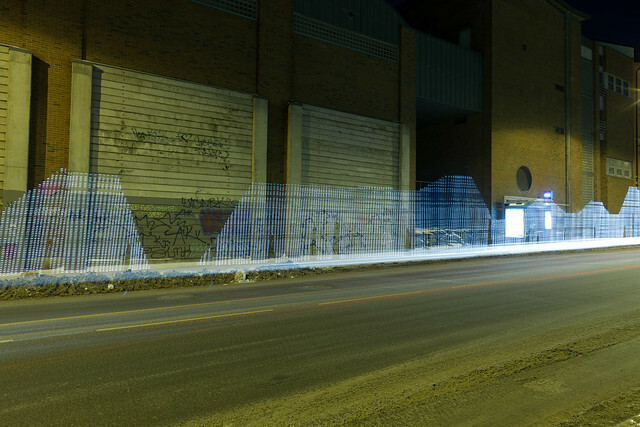 The light paintings show how the network’s behaviour depends on where it is located and how the city around it is built. A brick wall creating a shadow in a network protruding from the other side. WiFi networks can, both practically and metaphorically connect different environments. The radio waves from WiFi base stations flow from indoor domestic spaces and semi-private work places, into public parks, streets and bus stops. A typical example of how WiFi networks can bring new functions to urban environments is the case of a university network extending into a nearby park. This makes it possible for students to use the park as a networked area when the seasons allow it. However, this password protected park-network is both technically invisible and practically unavailable for anyone else. A university WiFi network stretching across a park. A bus stop within a WiFi network. The spaces into which new technologies are deployed are not stable, not uniform, and not given. Technology can destabilise and transform these interactions, but will only ever be one part of the mix. WiFi networks are an early example of the technological phenomena that makes up the networked city. As new communication standards and pricing models get introduced WiFi may become obsolete, but it is has been one of the first examples of effective ways of bringing the internet into the city. WiFi also have characteristics that illustrate challenges and possibilities posed by networked cities: WiFi is invisible, complex and increasingly mundane. A WiFi network along a heavily trafficked road. WiFi networks are both physically invisible and technically obscure, which makes them blackboxed on multiple levels. The detailed technical level of the infrastructures, data traffic and electromagnetic fields that our mobile devices are built upon are obviously complex and difficult to understand. However, there are also interactional and material aspects to how we experience these technologies that are similarly opaque and vaguely understood. This material level is especially important for design research as it is not only related to the technical and infrastructural properties of the technologies, but also to how they are experienced as spatial, material and interactive phenomena in the city. Through visualisations and the process of creating them we have unpacked some of the qualities of WiFi networks and made them understandable as spatial and contextual phenomena. This process of making the phenomena material through visualisation shows how digital structures and physical environments are interwoven elements of the urban landscape. It also illustrates how our interactions with devices and networks are a part of the fabric of everyday urban life. 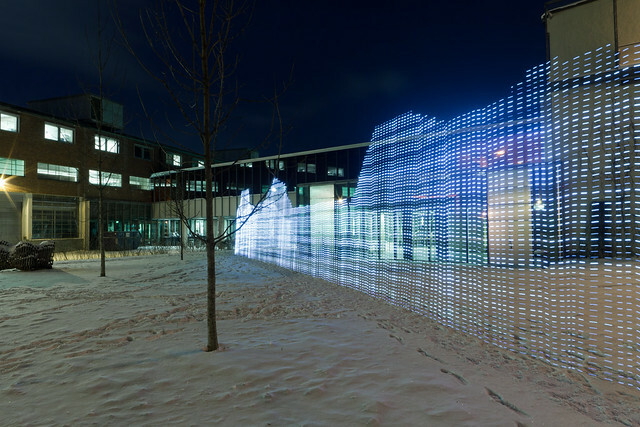 ‘Immaterials: Light painting WiFi’ points towards potentials for materialising and contextualising invisible technologies through light painting and visualisations. Hopefully, the film situates the networked city within the everyday environments in which it take place. 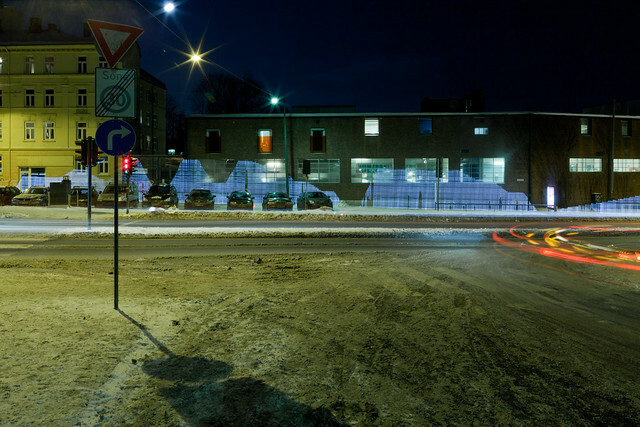 The light paintings illustrate how the networked city can be both ubiquitous, messy, informal and seamful, and emphasise how the invisible landscape of networks is another layer of the dense and complex urban contexts we already know. 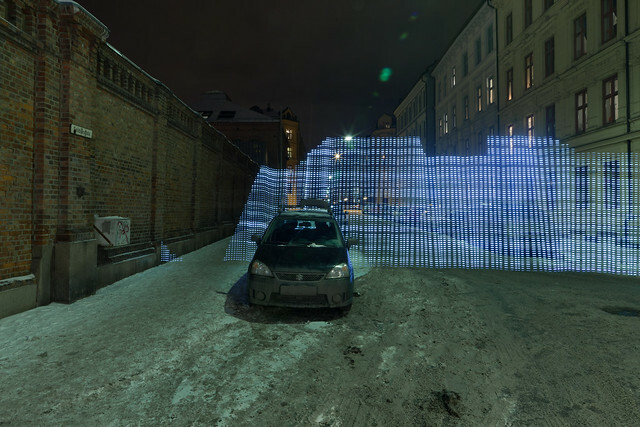 ‘Immaterials: light painting WiFi’ is created by Timo Arnall, Jørn Knutsen and Einar Sneve Martinussen. The film joins together Touch, YOUrban and Einar’s PhD project on design, technology and city life. Einar is also writes about this work in a chapter for a forthcoming book titled ‘Design Innovation for the Built Environment – Research by Design and the Renovation of Practice’ edited my Michael U. Michael U. Hensel. Timo writes more about immaterials and WiFi on the Touch weblog. Thanks to Andrew Morrison and Jack Schulze (BERG). Greenfield, A. 2009. The kind of program a city is [online]. Available at: http://speedbird.wordpress.com/2009/10/08/the-kind-of-program-a-city-is-2/ [Accessed 24 February 2011]. Martinussen, E. 2011 forthcoming. Making material of the networked city. In: Design Innovation for the Built Environment – Research by Design and the Renovation of Practice. Routledge, Taylor & Francis. Mitchell, W.J. 2004. Me++: The Cyborg Self and the Networked City. Cambridge MA: The MIT Press. Since vertical height is a meaningful component of terrain in an everyday sense, there’s a little bit of a visual metaphor mismatch, with higher signal strengths looking like virtual “walls”, and thus appearing to be wifi network boundaries, when in fact the lower signal strengths are more the boundaries. I’d be interested to see experiments with alternate representation of signal strength, say diffuse on/off states of the lights, rather than stacked from the bottom, and maybe walking in a more sweeping fashion, rather than in a straight line. Would also love to see this work coupled with a spectrum analyzer. I get what Brent is saying. It could be an evolution. I’m not so sure about having a diffusive effect on the lights for stronger/weaker signals. Judging from the pictures it’d be hard to tell which was which. A spectrum analyzer would be very cool to add, though. Nice work to whoever did this project. Brilliant project and Brent you are right about this mismatch but maybe it is even more interesting like that. Looking forward for further development. This is just great; there is something wonderful about revealing – visually – information hidden in the air around us. Congratulations. What about changing colours based on the number of wireless networks detected? You could see at a glance for instance one white higher peak and lesser strengths with varying degrees of intensity. Empower with colors for public vs, unprotected vs. password available on request vs. locked networks. That’s so great! May we use the pictures for a blog post? Thank you, yes you may of course use the pictures in your blog. Using the Flickr URLs from the pictures on this site should not be a problem. Wow, what is the name of this music track? It works so well with the images. Yes, what about the health implications? Sistematically underestimated, if not denied at all. It is a fact that, until we cannot see it (or hear it, or smell it) we remain unaware of being constantly, passively exposed to a massive amount electromagnetic pollution. And this is only the WiFi network. Worrying. You should be much more worried about that massive electromagnetic wave generator in the sky that pummels the earth daily. Microwaves put out 800-1000Watts, radar puts out 10-100KW but a wifi base station only uses 0.1W… but the earth absorbs 122 Terawatts of radiation from the sun each day. Very good idea, and it was built and shot in nice way. I am trying to see, what other implementations it can have or what are its applications ? Congrats for your project, i took the liberty to talk about it on my website, i hope that i have talked about it right. Yeah, I was thinking the same thing. Sweeping across the landscape with a linear grid of these would produce a 3d version of the same thing. Great idea. Useful and poetic. Wonderful idea, and a beautiful implementation. Thanks for making the world nicer. A magnificient idea and wonderful visulization! thanks for the wow moment of the day…wow. Your artwork is great and I like the light idea and design. My friend mailed to me about your artwork because I have some Wi-Fi artwork. I think you maybe interested in them, so I attach the links below. Aaaaaaaaaaaaaaaaaawwesome! Seriously. 60 x 60 mounted print please. Thanks! Wonderful work and such a clever insight to think of revealing this hidden presence in a way that is both readily grasped and beautiful to observe. Congratulations, very good work. Have you considered building a similar apparatus with a GPS module, and recording the signal strength and recorded position and making a topographical map (or heat map overlaid on a real map) from the data? Fantastic, saw the comments on Nasjonalgalleriet/nrk yesterday. i’d be curious to see how a pinwheel cluster would look like, representing a specter of frequencies! Great concept and execution. At the IXDA seminar yesterday you mentioned two reasons why this project has got so much attention. You forgot a third: the aesthetic qualities, the images are simply stunning! I have to agree with Brent and he’s absolutely right, with this lights stacked you’re showing the power density of the signal in a given point but you should also pay attention to where it is messure because the space in which the signal’s power density is spread may not be a straight bar as you’re showing in the video above. It may be interesting to see that too. In general, I love your concept it has opened my mind to new ideas. thank you. This is absolutely great. Congratulation! It definitively has its place in a contemporary art gallery. I hope you are considering it. I would love to see this project as an exhibition in places like Palais de Tokyo (Paris) or Casa Encendida (Madrid), etc. What’s next for you guys? How do you plan to continue this project? What a brilliant idea way to go. I was mesmerized by the video. Cool video; and a great concept. Keep up the good work! Very nicelightpainting of the immaterial terrain in the city indeed!